The anti-war movement and a wide array of progressive people’s forces is set to protest outside the Sept. 1 Republican National Convention in Saint Paul, Minnesota. Organizers are predicting more than 50,000 will fill the streets on Labor Day 2008. Protesters will confront the war-makers, racists and reactionaries who just a few years ago were bragging that Republican rule would last forever. The Republicans are desperate to turn around their decline, after losing big in the November 2006 congressional elections. More recently they lost three special elections, one each in Mississippi and Louisiana as well as the seat held by former Speaker of the House Dennis Hastert of Illinois. The American people are frustrated by the Iraq war, worried about the economy and angry about corruption. The writing is on the wall. It may be in misspelled English, and it may be on the wall of a destroyed house in Iraq, but it is clear that the U.S. occupation is going down and taking the Republicans with it. So up steps John McCain to receive the Republican crown. McCain is the war and occupation candidate. He is determined to carry forward the Bush agenda and is dedicated to the occupation in Iraq for “maybe 100 years.” “That would be fine with me,” McCain said at a January 2008 campaign stop. More recently McCain changed his tune with a plan to get troops home by 2013 – just in time for the next presidential election. We ask, “Who is he trying to fool?” McCain is more of the same – more war, repression, inequality and tax cuts for the rich. The same tired, worn out politics. Besides, have you seen this man when he gets angry? On Nov. 4, 2008 we are calling for a vote against McCain. The stage is set to vote out the Republicans and to reject their reactionary agenda of war, immigrant bashing, rolling back the rights of women, racist inequality, discrimination against gays and lesbians and poverty. A vote against McCain will create better conditions for working class and oppressed people to make change in our society. Most importantly, we are calling for a vote against McCain because it will be seen as a referendum on the U.S. occupation of Iraq. Four years, let alone 100 years, is too long to wait. While Hillary Clinton has sunk to her lowest, Barack Obama has risen to answer the attacks and prompted uncomfortable discussions at coffee shops, lunch counters and dinner tables across the country. The United States was built on national oppression: the seizure of land from Native Americans, the slave labor of Africans, the exploitation of immigrants from Asia and Latin America. The struggle against racism and for equality are not just struggles of the past, they continue today, as seen in the fight for immigrant rights, justice for Katrina survivors and against the harassment of Arab Americans and American Muslims. The facts are plain; Obama parts ways, to a degree, with Clinton on the Iraq War, free trade agreements and racism. He has a message of hope with wide appeal. However, Obama operates well within the confines of the Democrats and their big business backers. That said, his election will create a better political climate for the anti-war, immigrant rights, labor and national movements. And no matter who is in the White House, it is important for progressives to stay active and to fight for an agenda that places the peoples needs first. Say no to war, racism, discrimination and reaction! 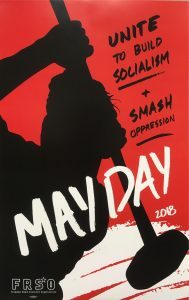 May Day 2017: Defend immigrant rights and build workers unity! Defeat Trump! Previous post McCain: Down in Flames!